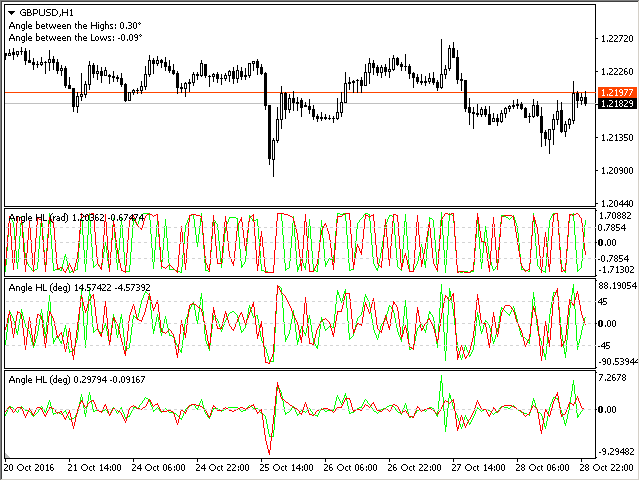 The indicator calculates the inclination angle between the Highs, Lows and Closes of adjacent bars. The angle can be measured in degrees or radians. A linear graph or a histogram is drawn in a subwindow. You can set the scale for the calculation — floating or fixed. For use in Expert Advisors or indicators, you need to specify a fixed scale. Angular measure — degrees or radians. Scale mode for calculation — scaling mode. 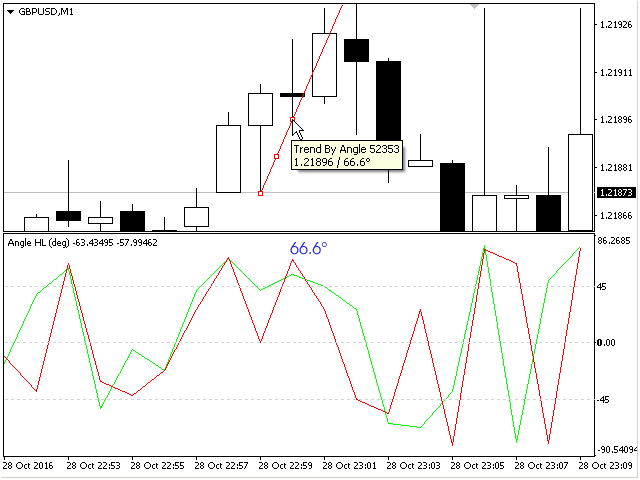 Free scale — free transformation, the indicator will calculate values each time the chart scale is changed. 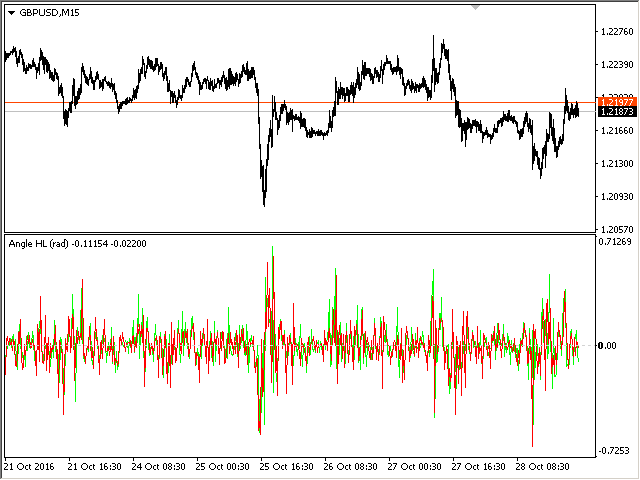 Fixed 1:1 — fixed scale (data will not be changed when the chart scale changes), calculations are performed in the 1:1 chart scale. Fixed 1:10 — fixed 1:10 scale, 1 unit along the Y-axis is increased tenfold. Further scales change accordingly. Show comment — show current data in a comment. 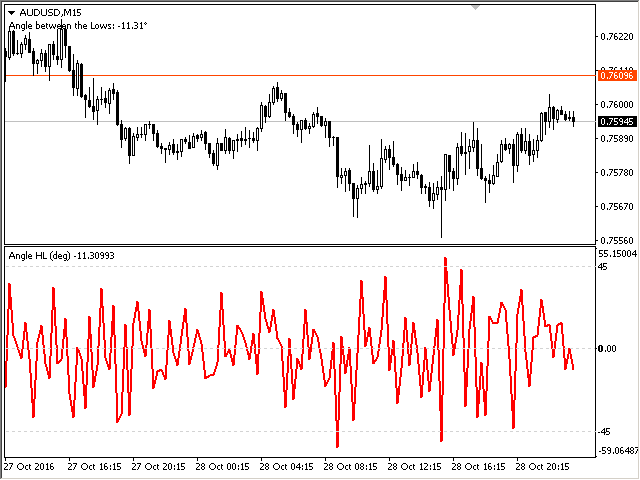 Indicator Level 1 — value 1 for the indicator level. 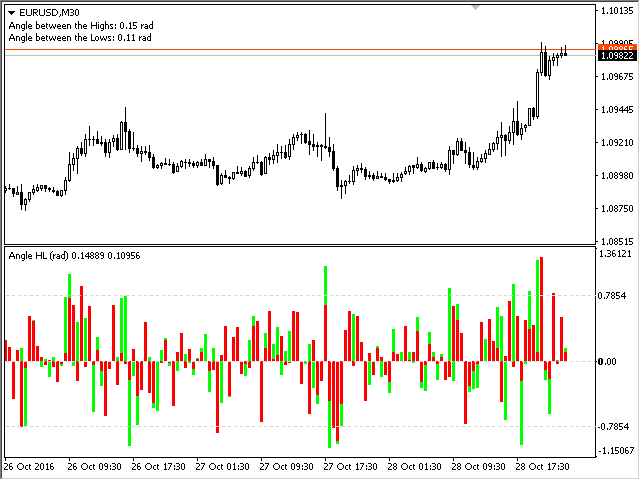 Indicator Level 2 — value 2 for the indicator level. 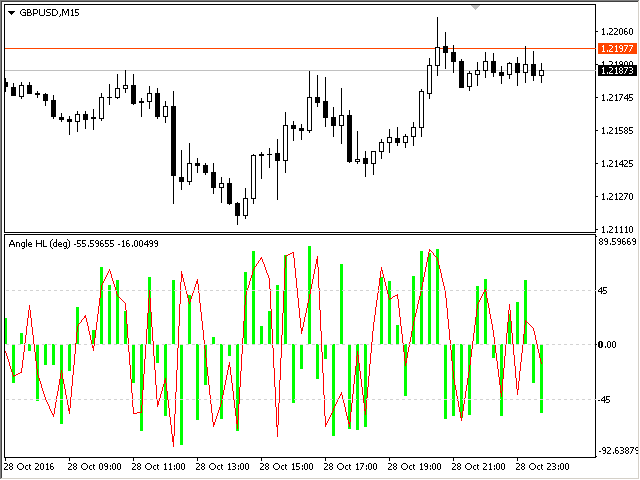 Indicator Level 3 — value 3 for the indicator level. Build angles of Closes — enable plotting angles based on Closes. Style — drawing style for Closes: line or histogram. Color — the color of the Close lines. Line width — the width of the Close lines. 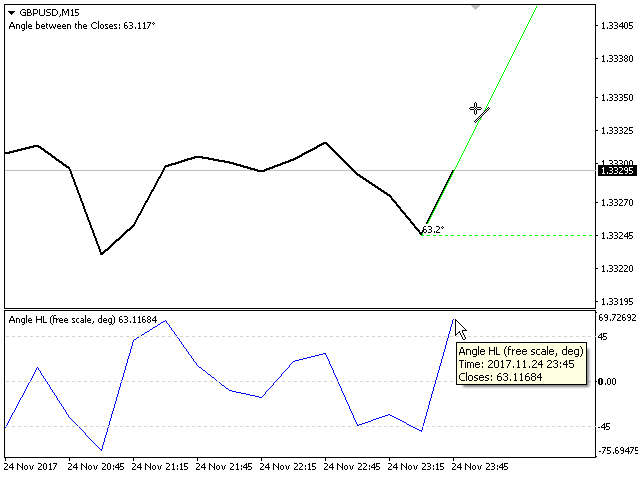 Build angles of Highs — enable plotting angles based on Highs. Style — drawing style for Highs: line or histogram. Color — the color of the High lines. Line width — the width of the High lines. Build angles of Lows — enable plotting angles based on Lows. Style — drawing style for Lows: line or histogram. Color — the color of the Low lines. Line width — the width of the Low lines. 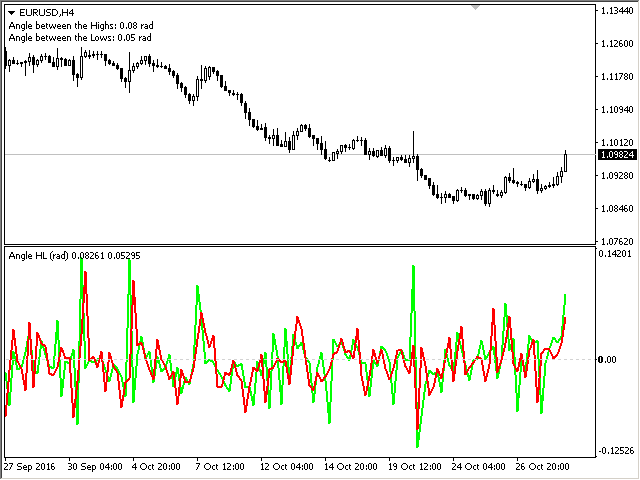 The fixed scale in MT5 differs by 10 times from the same scale in MT4. For use in the EA, you need to specify a fixed scale. 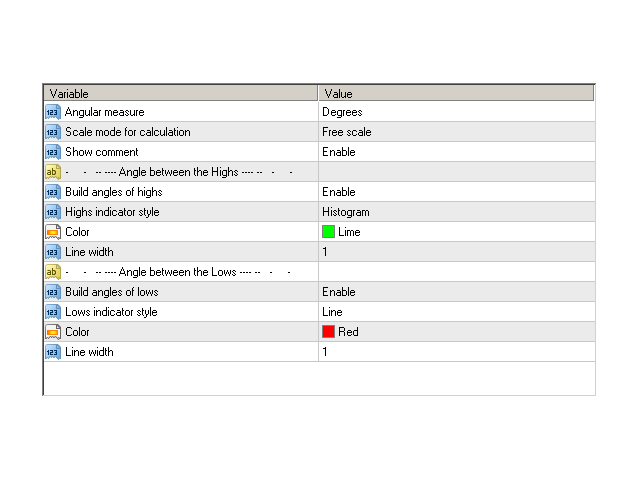 1) Added calculation of the inclination angle between the Closes of adjacent bars. 2) Added parameters for the levels of the indicator "Indicator Level 1-3".